While the first derivative of a function is the change in y due to a change in x, the second derivative of a function is the change in it's first derivative due to a change in x. Tap the exponent key (x^) three times to use the second derivative key (x''). Enter the argument in parentheses. Find the second derivative of each expression below. Enter each expression as given with one per line. 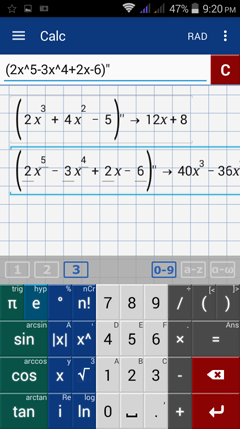 Enter the expression in parentheses and tap the exponent key (x^n) three times to enter a second derivative.